Mkhwebane visits Limpopo as part of nationwide roadshow - SABC News - Breaking news, special reports, world, business, sport coverage of all South African current events. Africa's news leader. Advocate Busi Mkhwebane is in Limpopo as part of her office's nationwide road shows. 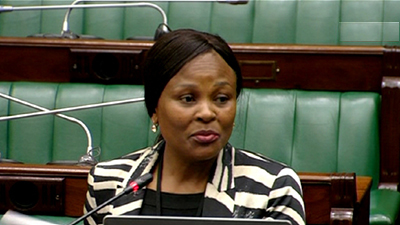 Public Protector Advocate Busi Mkhwebane says she is growing increasingly frustrated with Treasury for not implementing the Public Protector’s remedial actions over pension pay-outs to the former Venda homeland employees. Her predecessor Thuli Madonsela recommended that beneficiaries of the Venda Pension be paid funds due to them. Mkhwebane is in Limpopo as part of her office’s nationwide road shows. Mkhwebane is critical of Treasury and says she will write to the Speaker of Parliament about the pay outs. More than 25 000 people stand to benefit. Meanwhile, the people of Driekop, which boasts two Chrome and Platinum mines, have accused the state and the mining industry of failing in their corporate social responsibility. Mkhwebane concludes her visits to the province on Thursday. This entry was posted on 15 Aug 2018,07:10PM at 7:10 PM and is filed under South Africa. You can follow any responses to this entry through the RSS 2.0 feed. Both comments and pings are currently closed.